When a child is born there is a flurry of excitement and celebration that can sometimes leave a mom in need of a little attention. Even the most organized expecting parents may not have thought to pack the hospital suitcase with special treats to help revive and pamper the exhausted mom after the happy bundle arrives. That?s why at Roper St. Francis (RSF) Mount Pleasant Hospital?s Women?s Center, expecting moms get to expect a little something extra in addition to the main attraction. The hospital announced today that women delivering their babies in the hospital?s Mother and Baby unit get to choose between three gifts to help them feel pampered. ?After giving birth a massage was just what I wanted. My hands and feet really needed some TLC,? 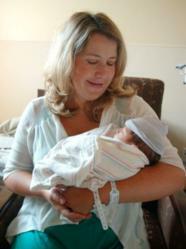 said Elizabeth B., a new mom who delivered her baby at RSF Mount Pleasant Hospital. ?It was really special. All of the attention, as it should be, was on my sweet new baby boy. But moms need to take care of themselves too, which is why this gift meant so much.? Posted on September 5th, 2011 at 12:04 am.